Sapphire Villa is a large detached villa over 3 floors in Calis. Only 15 minutes walk to Calis Beach, promenade and aqua park. 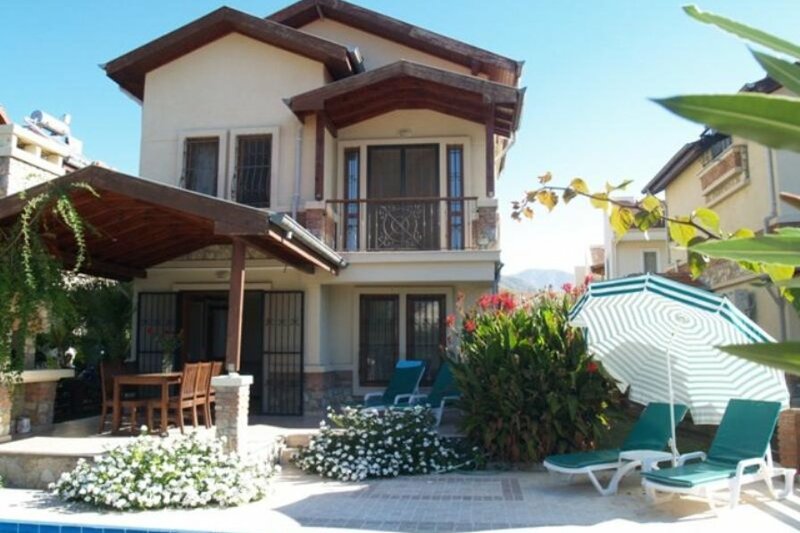 This luxury 3 bedroom detached villa is over 3 floors and situated in a quiet area of Calis. The villa is located in the direction behind the Pelin Hotel, over to the right side, but not as far as the main road. The villa has a large private swimming pool, extensive landscaped gardens and a covered terrace. Available to use outside are table, chairs and sun loungers. With a large open plan kitchen including breakfast bar and washing machine. The living and dining area are open plan and includes a TV/DVD player and playstation 2. On the first floor, there are two twin bedrooms, a large family bathroom with luxury spa shower. On the top floor there is a double bedroom with en-suite bathroom and storage. The villa is cleaned and beds made up ready for your arrival. However, if your stay is more than one week, and you would like an extra mid holiday clean, we can arrange this for you for a small fee. Less than 10 minutes walk away are a number of local shops. It only takes 15 minutes to walk to the beach and promenade. Catch the local bus service from the main road, a few minutes walk away. Calis is a busy resort, with a long narrow sandy and shingle beach. Along the promenade are many shops, restaurants and bars. Fethiye is a bus ride away and situated around a wide bay, and is a bustling, friendly market town surrounded by spectacular mountains and stunning scenery. Enjoy a stroll along Fethiye harbour, or relax with a drink or meal in the many restaurants and cafes around Fethiye. Haggle at the local markets in Calis on Sunday and in Fethiye on Tuesday and grab a bargain. Take the bus to Calis, Fethiye, Olu Deniz (blue lagoon), Hisaronu, Ovacik and Kayakoy. Or try the water taxi from Calis front which takes you into Fethiye. There are many activities to do in the area from the water park at Calis, to a daily boat trip from Fethiye exploring the 12 islands. For the more adventurous try paragliding, horse riding or scuba diving. Turkey has many historical sites from Ephesus (one of the 7 wonders of the world) and Pamukkale (cotton castle) to the ruins of Tlos and the hidden canyon at Saklikent. Stay off the beaten track and see the real Turkey on a Jeep Safari or cruise down the Dalyan river and visit the famous mud baths with the promise of looking 10 years younger after you wash the mud off! - Or hire a car through ourselves and explore the many sites of Turkey at your leisure and discover the real Turkey! This villa is privately owned and managed by Rainbow Property Care. Based in Calis, we are on hand to look after you during your holiday, if needed, and can provide you with a local contact number for emergencies. We also arrange airport transfers, welcome packs and car hire (extra charge).